Discover the new edition of the award winning puzzle series on your mobile. 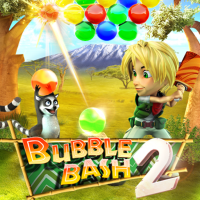 Bash together 3 or more like-colored bubbles to make them all explode just like before. But this time, you’ll take the adventure to enchanting Africa. 16 challenging game modes filled with new special bubbles add a whole new spice to the game. It takes only seconds to master, but you’ll play for hours. Beware: this game is highly addictive… Just ask its million fans around the world!